The Sulcis Iglesiente in the south west boasts 200km of coastline and the Sarrabus region in the south east another 200km. Both have a grand choice of magnificent beaches. Compared to other parts of the island, the south west coast is relatively underdeveloped whereas the south east coast is more developed and dotted with summer residential areas. However, with a little exploration you will find deserted bays and coves. The most popular beaches can be accessed by car followed by a short walk. Beware of the Mistral Wind; children’s inflatable toys should not be used as the northerly wind will blow them out to sea….towards Tunisia! There are plenty of opportunities to partake in a spot of snorkelling if you wish to catch a glimpse of life beneath the sea. Cala Cipolla, Sa Tuerredda and Is Molentes beaches are perfect for this. Choose from the many water sports including windsurfing, sea kayaking, sailing or scuba diving which can be organised from most beaches. Speedboats and sea scooters are also available to hire at some beaches so bear this in mind if you are looking for a peaceful spot to relax. Bluefan Water Park is a fantastic day out for the children with a great selection of waterslides as well as other facilities including bars, restaurant and picnic area. 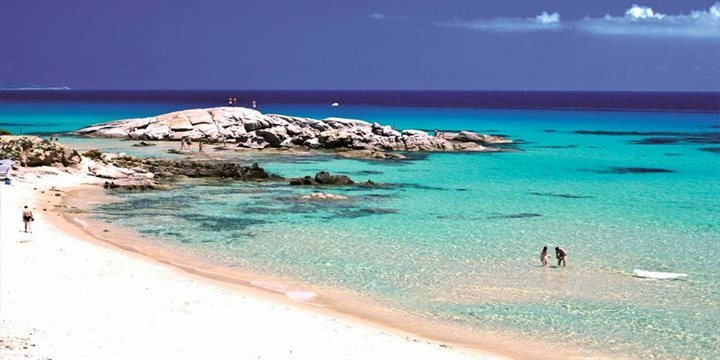 It is located on the way to Cagliari. If you wish to explore the lesser-known parts of the Sardinian mountains or along coastal trails, walks and climbs can be arranged to satisfy your own tastes and level of fitness. Sunrise and sunset walks are amongst the most popular requests. Also, gentle cycling or mountain hiking is a great way to cover longer distances and explore higher ground. Bike hire can also be arranged. Fishing and horse riding are other popular activities in the area and can be arranged through several operators in the main tourist areas.